Lock in a great price for Designhotel ÜberFluss – rated 8.6 by recent guests! Pool was fantastic! Room was great and staff super friendly and helpful. The room was spacious and equipped with a kitchenette but I would have much rather had a view to the river with a room half that size! They overcharged us. Our confirmation was for 154 dollars taxes included. They charged us 183 euros. Would you see we get a refund? The staff was nice and helpful. The location of the apartments was great, the equipment was also great, sometimes hard to use: the switches for light and the shower-switch. We had a nice room at the hotel, we just missed the view. Also the spa was very nice and clean. Great location and nicely finished rooms. Flash and very new. Shower and toilet were nice and clean and bed was comfy. Modern and aesthetically pleasing boutique hotel on the fringes of the city centre. Nicely appointed and spacious room and decent enough bathroom. Kitchenette may prove of use to some. Tea facilities and sweets in the lobby. Nice spacious room with well equipped kitchen (we booked the family room). Room was also very clean and good looking (modern). Location is a big plus, certainly recommended when visiting Bremen. Designhotel ÜberFluss This rating is a reflection of how the property compares to the industry standard when it comes to price, facilities and services available. It's based on a self-evaluation by the property. Use this rating to help choose your stay! One of our top picks in Bremen.This exclusive, 4-star-superior hotel has a spa with indoor pool. It offers free WiFi in the public area and a French-Italian restaurant. Just a 3-minute walk from Bremen’s historic pedestrian area, the Designhotel ÜberFluss has strikingly designed, spacious rooms with décor by Charles Eames and Tom Dixon. 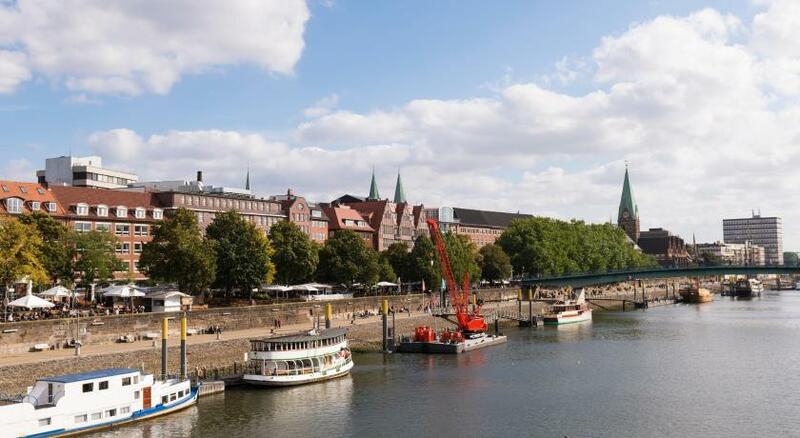 Many rooms offer views of the Weser River. The DesignHotel’s spa area includes a sauna, steam room, and modern gym. The relaxation room features the oldest part of Bremen’s city wall. Mitte is a great choice for travelers interested in old-town exploration, architecture and city trips. When would you like to stay at Designhotel ÜberFluss? Design-style room with a flat-screen TV, mini-bar and private bathroom with complimentary toiletries. Boutique-style suite with a flat-screen TV, free mini-bar and private bathroom with complimentary toiletries. Includes a sauna and hot tub. Offers a view of the Weser River. Boutique-style room with a flat-screen TV, minibar and private bathroom with complimentary toiletries. Boutique-style room with a TV, minibar and private bathroom with complimentary toiletries. Hotel surroundings – This neighborhood is a great choice for travelers interested in old-town exploration, architecture and city trips – Check location Excellent location – show map Guests loved walking around the neighborhood! House Rules Designhotel ÜberFluss takes special requests – add in the next step! Designhotel ÜberFluss accepts these cards and reserves the right to temporarily hold an amount prior to arrival. There was no coffee maker, neither at the apartments nor in the hotel. Service at breakfast time was poor, no cleaning up the tables, nor questioning for another coffee, tables too small, full of stuff which you don´t need for breakfast. ( lights, and extra glasses) The laundry trolleys were all the time around on the floors. Day and night. The staff were very rude! Upon arrival they told us breakfast was included so we had it for that reason and found it quite good. Upon check out, we were charged an extra 35 euros for breakfast! We explained that we had been told it was free and were met with a “I’m sorry, there’s nothing more I can do”! She then asked where we were from (what does that have to do with it?!) and was very rude and short with us. Not receptive and very defensive. This really left us with a bad final impression. Other thing to note was the spa wasn’t finished so we couldn’t use the steam room or showers by the pool. Disappointing for the money paid. For those on the city side, intrusive noise from the street, especially for those on lower floors but worse was the din from the adjacent room, doubtless not helped by the wood effect flooring. Indifferent quality beds/bedding/pillows. The room was spacious and clean. We used the pool which was very nice (wish it was a bit warmer in winter though) . We stayed here to go to Christmas market and this hotel is at the best location to go to the market. Beds were rather hard. Shutters at windows did not close well therefore in the morning it is light early in the room. Internet connection (WiFi) sometimes unstable. Long check out 1/hours, narrow garage. dangerous edge to step up for one bed. Spa was perfekt👌 Jennifer and Miriam at the Front Office were very kind and helpful, thank You girls for everything!! Loved the hotel. It’s much nicer that what it looks like on the pictures. The staff were incredibly friendly and helpful. I wanted to stay longer. Breakfast was great !